URBAN STREET RIDING AND MTB HILLBOMBS IN SAN FRANCISCO WITH SAM PILGRIM! URBAN MTB STREET TOUR durch die Hauptstadt BERLIN! URBAN MOUNTAIN BIKE STREET TOUR in ZURICH, SWITZERLAND! URBAN MTB & BMX STREET TOUR in BARCELONA! URBAN MTB FREERIDE STREET TOUR in SCHWEINFURT, GERMANY! Opinion: eMTB = MTB substitute? Our good friends at Woom Bikes and Buddy Pegs Media and spearheading an awesome weekend in Austin Texas. If you are anywhere close, you should definitely go. There is also a sweet contest. read below to find out the finer details. The Raise Riders Family Bicycle Weekend is a multi-day celebration of family bike riding that coincides with the legendary Austin Marathon. Bring your kiddos to enjoy family friendly group rides, woom bike demos, Buddy Pegs Bicycle Playdates (for children 6 and under), author readings, raffles, bicycle scavenger hunts, and more! Whether you are coming in for the Marathon and wanting to entertain your children while your loved one prepares for their run, or just looking for a fun way to connect as a family on bikes, our festival is for YOU! RESERVE YOUR SPOT FRIDAY 2/5/19 At The Palmer Events Center 10:30am &#8211; 12:30pm: Age specific family group rides along the Ann and Roy Butler Trail (exact times and routes TBD) Bike Scavenger Hunt 1-4pm: woom bike demos for children 2 &#8211; 10 years old Buddy Pegs Media fun and games, Bicycle Playdates and Bicycle Playground (kids 2-6 years old) Author readings and book signings Bike-centric arts and crafts SATURDAY 2/16/19 At The Palmer Events Center 10am &#8211; 5pm: woom bike demos (kids 2 &#8211; 10 years old) Buddy Pegs Media fun and games Bicycle Playdates and Bicycle Playground (kids 2-6 years old) Author readings and book signings Bicycle Scavenger Hunt Arts and crafts table 11:45am: 1st Annual Youth bicycle category in the Manzano Mile event 1 mile out and back ride from Riverside Drive Start/Finish Balance bike and pedal bike divisions SUNDAY FEBRUARY 17TH At The Austin Marathon Finish Line Festival (7th & Congress) Buddy Pegs Media Bicycle Playground (kids 2-6 years old) woom bike demos Bicycle games and prizes Christian Bezdeka and Marcus Ihlenfeld developed woom in Europe before Mathias Ihlenfeld (Marcus&#8217; brother) launched the USA branch in Austin, TX. woom is a family business born from a love of bicycles and a desire to make children happy. What started as a search to create the perfect children&#8217;s bike developed into a goal: build bikes that inspire children and their parents. The Buddy Pegs Bicycle Playground was developed to give children 2-6 years old a safe place to develop skills, confidence, and a love of riding through life on two wheels. Experienced Buddy Pegs ride leaders will be on hand to guide paretns and children throughout the weekend. CRANK OUT THE MANZANO MILE Two Bicycle Divisions for kids! Saturday February 16th 11:45 Children on Pedal bikes (full mile) 11:55 Children on Balance Bikes (1/2 mile) The Manzano Mile is named for 2019 Austin Marathon Official Race Ambassador and 2012 Olympic silver medalist Leo Manzano. Leo is a highly decorated track star, four-time USATF National Champion, seven-time Team USA member, two-time Olympian, and the first Olympic medalist for the USA in the 1500m since 1968. The Manzano Mile embodies Leo ’s passion for reaching out to the community, specifically to local youth, through health and fitness programs. REGISTER HERE FUEL UP AT THE KODIAK CAKES PANCAKE FEED! 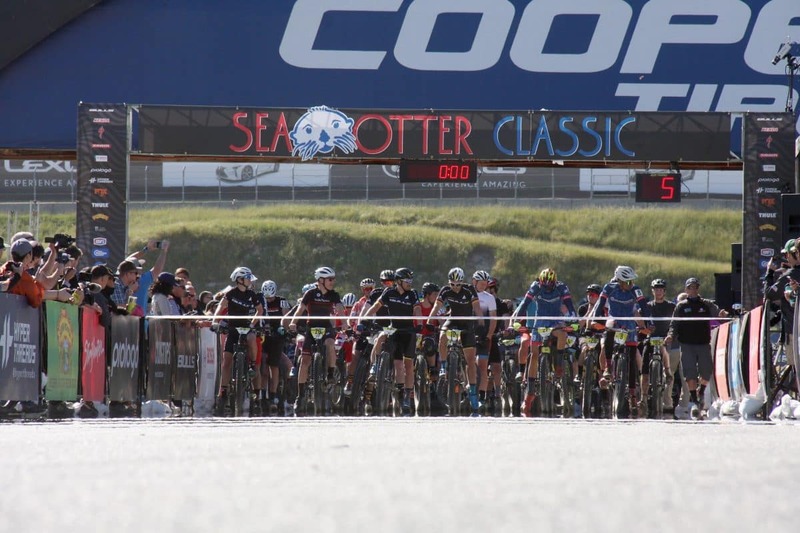 Saturday 10am &#8211; 12pm At the Manzano Mile Start/Finish Area Our friends at Kodiak Cakes will be on hand to make sure you and your little one are fueled up for the Manzano Mile and a day of adventure together on two wheels! These are the best, most protein pancakes you&#8217;ll ever smother in maple syrup! SHARE YOUR LOVE OF BIKING & VISIT AUSTIN The best way to explore downtown Austin with your family is from the seat of a bike! The Raise Riders Family Bicycle Weekend is an amazing opportunity to meet other like-minded parents and watch your little ones develop the riding skills, self-confidence, and resilience they&#8217;ll carry with them for life. Click to Register CLICK TO REGISTER UPGRADE YOUR CHILD TO A VERY IMPORTANT PEDALER Each VIP package includes: Event T-shirt from Recover Brands (100% recycled) Special gifts from woom and Buddy Pegs Media Amazing coupons and promotional deals from our partners Priority admission to the Buddy Pegs Bicycle Playdates (optional) Priority start line &#8220;call-up&#8221; at the Manzano Mile Priority woom demo bikes Commemorative event poster $25/child GRAB YOUR VIP SPOT JOIN THE RIDE We would love to have your family join us at the 1st Annual Raise Riders Family Bicycle Weekend! Register for FREE or grab one of our limited VIP (very important pedalers) spots for that includes a limited edition event t-shirt, gifts from our supporting partners, priority spots in our Bicycle Playdates, and more! CLICK TO REGISTER GETTING THERE The Raise Riders Family Bicycle Weekend is a perfect way to explore downtown Austin, TX as a family. All events are conveniently located located next to the Austin Marathon Health & Wellness Expo Friday and Saturday, and Sunday&#8217;s Finish Line Festival. THE PALMER EVENT CENTER If you are going to drive, we strongly encourage carpooling as traffic gets quite busy all around downtown race weekend. To book convenient and affordable parking, we recommend using SpotHero, the nation’s leading parking reservation app. To reserve your parking spot today, visit the Austin Marathon Expo SpotHero Parking Page and book a spot with rates up to 50% off drive-up. New to SpotHero? Download the SpotHero iPhone | Android app There are lots of bicycle racks on site so avoid the parking fees and ride your bike! There are also two Austin B-Cycle stations around the Palmer Events Center available. Visit CapMetro.org for information and schedules on Metro Bus and Metro Rail. THE FINISH LINE FESTIVAL Look for the woom and Buddy Pegs Media tents at 7th St & Congress Ave where we&#8217;ll have a Bicycle Playground and demo bikes for children 2-6 years old. Parking in the downtown area within walking distance of the start and finish lines is plentiful. There are numerous free and paid parking garages and surface lots as well as free on-street parking downtown. On-street metered spots are free of charge on Sundays. To book convenient, affordable, and stress-free parking in advance, use SpotHero to reserve your parking spot today. Visit the Austin Marathon SpotHero Parking Page and book a spot with rates up to 50% off drive-up. The post The Raise Riders Family Bicycle Weekend appeared first on The Bike Dads. instagram:@anttonmiettinen &nbsp; If you want to unlock the full potential of your riding skills, you must first unlock yourself from your saddle. Yup, you read that right. Getting out of the saddle is the key to riding faster, safer and more confidently. It may sound simple to just hop up out of the saddle and shred, but a lot more is involved. In this month’s &#8220;The Trail Starts Here,&#8221; we teach you fundamental body positions that will improve your out-of-the-saddle riding. But, don’t feel the need to stand up just yet. Instead, kick back, relax and enjoy our latest installment of &#8220;The Trail Starts Here.&#8221; STANDING VS. SITTING Sitting on your bike puts you in a great position for creating power and relieves pressure on your legs; however, a seated position can limit your control over your bike. When you want to &#8220;attack&#8221; the trails, you need to be standing in an aggressive yet neutral position. Your belly button should be aligned directly above your bottom bracket and your chin should be over the stem. Keep your core tight, your back level to the ground and your legs and elbows bent at an equal angle. It’s also crucial that you keep your elbows high and pointed upwards, but not in an exaggerated position. Replicating the look of a motocross racer won’t offer you the best control over your bicycle. Keep your shoulders down and make sure to hinge at your hips in order to enhance bike control. The stance we’re describing here is referred to as the &#8220;attack position.&#8221; The attack position can be used any time a rider is out of the saddle. In fact, it should become a natural stance that you return to every time you are out of the saddle. When you are seated on your bike, your hips are locked to the saddle, making it a lot harder to let the bike move underneath you. A fast rider will often hold a balanced, front-to-back and side-to-side position over his bike while allowing the bike to move freely under him. We’ll talk more about this soon. RAILING TURNS Many riders imagine a street bike racer dragging his knee through the corners and think they need to lean as hard as they can off the side of the bike to make those fast and tight turns. Well, leaning off the side of your bike will likely cause you to lose traction and control, resulting in a crash. Riders who really know how to rail turns will hold a neutral body position and let the bike lean underneath them. It’s okay to allow your knees to bow out just a bit if it allows you to more comfortably lean the bike through turns. Remember to always stand during turns in order to unlock your body from the bike, maintaining a natural stance while your bike does the work for you. Another go-fast tip to work on is keeping your center of gravity low. Remember the attack position. This lowered stance over the bike will allow you to carry more speed through turns than a rider with a taller stance. Think about football players for a second. Just before two athletes collide, they both try to get as low as possible to improve their center of gravity. You can do the same on your bike. Another important thing to remember is to drive your weight through the bike. Focus on your belly button as your center of balance and drive weight through to your bottom bracket. It may also be helpful to remind yourself to drive weight through your pedals. Your hands, however, should have the light touch of an Italian sports car driver. FLYING DOWN THE TRAILS Every time the trails point down, you have to stand up. Descending in a seated position is not only dangerous, it greatly limits your ability to toss around the bike. Our test riders never let the saddle touch them during a descent. This allows them to rock their hips back and forth, placing weight over the front or rear end as needed. Standing for your entire descent will require more fitness but will pay off with the ability to stay fluid, resulting in more comfort and speed. Get out and ride Now that you’ve learned the benefits of standing, it’s time to get out on the trails and shred. And, to make it even easier, we even took notes. Here are a few things you can work on during your next trail ride. • Force yourself to stand as much as possible. • Find a neutral body position over your bike and return to it every time you stand up. • Remind yourself of the fundamentals of the attack position: Head and eyes up, back flat, hips hinged, knees and elbows bent, and body weight forced through the bike to the ground. • Stay fluid on your bike and allow it to maneuver underneath you. •Don’t put too much pressure on yourself. 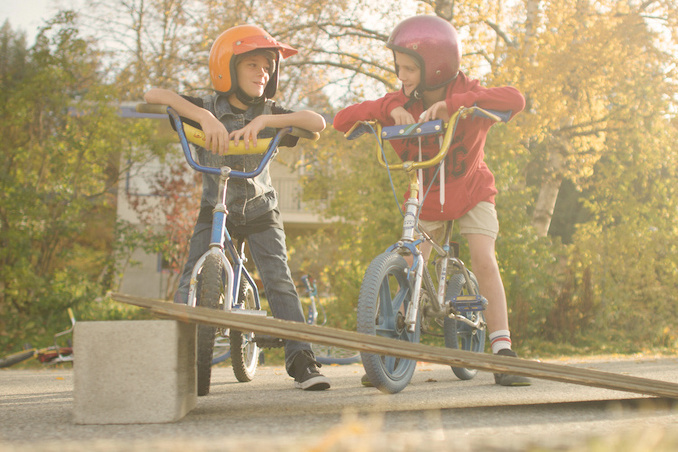 It’s just riding bikes, and it should always be fun! THERE ARE SO MANY WAYS TO GET ELECTRIC BIKE ACTION In print, from the Apple newsstand, or on your Android device, from Google. Available from the Apple Newsstand for reading on your iPad, iPhone or iPod Touch. Subscribe Here For more subscription information contact (800) 767-0345 Got something on your mind? 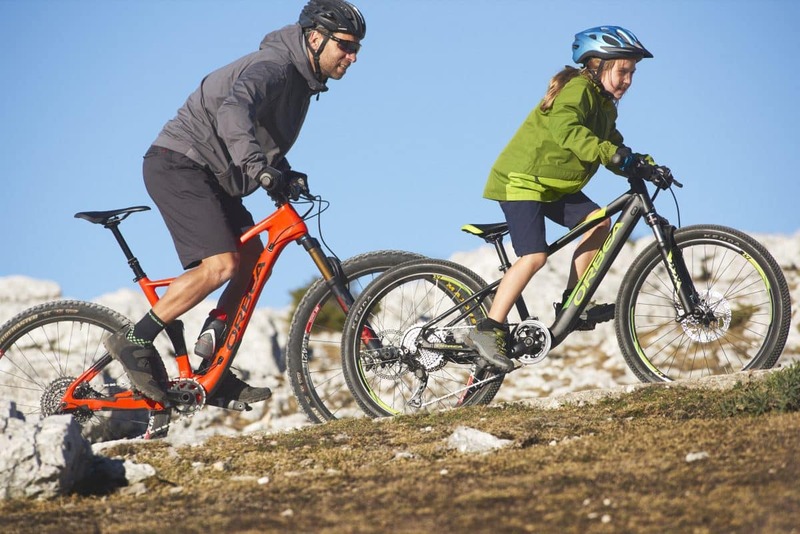 Let us know at hi-torque.com The post Stand Up and To Go Faster appeared first on Electric Bike Action.